Turkey Vultures are the most widely distributed vulture in the New World and somewhat more numerous than Black Vultures in Tennessee. Turkey Vultures can be easily identified because they hold their wings in a shallow "V" and rarely flap. Turkey Vultures have a highly developed sense of smell that helps them locate carrion, the dead animals that they feed on, and will spend much of the day soaring in search of carcasses. Turkey Vultures often feed on road-killed animals making them vulnerable to collisions with vehicles. Turkey Vultures breed from southern Canada to southernmost South America and the Caribbean. This species is partially migratory with more northerly nesting birds wintering in the southeastern United States and throughout Central and South America. Description: This large black soaring bird has a small, red, unfeathered head, long wings, and a long tail. They hold their wings in a "V" when soaring, flap slowly and infrequently, and appear to wobble or teeter-totter back and forth. The flight feathers are silvery-gray underneath, contrasting with the darker wing linings. Immature Turkey Vultures (July-November) have black heads. Males and females look similar, with the female being slightly larger. Black Vulture has white patch only at end of wings, has shorter wings and tail, and a black head. When soaring, wings are held flat, and it flaps much more frequently and with more rapid flaps. Habitat: Prefers rangeland and areas of mixed farmland and forest. Roosts are in large trees, on large urban buildings, and communication towers. Diet: Turkey Vultures eat a wide variety of carrion, from small mammals to dead cows and road-killed animals. They also eat some insects, other invertebrates, and some fruit. Turkey Vultures can rapidly ingest large quantities of food and then go several days without eating. 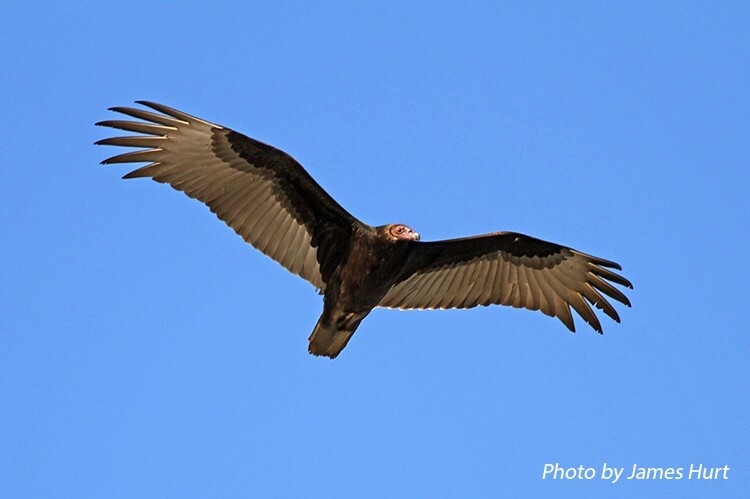 Nesting and reproduction: Turkey Vultures are monogamous and maintain long-term pair bonds. They frequently reuse nest sites. Clutch Size: Usually 2 eggs, occasionally 1 or 3. Incubation: Both parents incubate for 38 to 41 days. Fledging: Both parents feed young by regurgitating food. Young first wander from nest site after about 7 weeks, begin to fly at about 10 weeks, and typically leave the nest area by 12 weeks. Young birds join communal roosts. Nest: The nest is typically in a dark recess such as a shallow cave, hollow tree, under a rock ledge, log, stump, deer stand, or abandoned building. No nest structure is built. Pairs will continue to use a nest site for many years as long as breeding is successful. Status in Tennessee: Turkey Vultures are fairly common year round residents statewide. Breeding Bird Survey data indicate that the population is increasing. New World vultures are more closely related to storks than to members of the hawk family. The Turkey Vulture's highly developed sense of smell enables individuals to locate carcasses beneath a forest canopy. Black Vultures may follow Turkey Vultures to food and displace them. In response, the Turkey Vulture specializes on small food items that can be eaten quickly. The naked head and neck of both Turkey and Black Vultures prevent their feathers from becoming fouled when they stick them into rotting carcasses. The Turkey Vulture characteristically holds its wings in a slight "V". This gives them added stability and lift when flying at low altitudes. Flying at low altitudes allows them to better pick up the scent of dead animals. When they are hot, Turkey Vultures often defecate on their own legs, using the evaporation of the water in the feces to cool them down. The Turkey Vulture is the main avian species causing damage and fatalities in military aircraft collisions in the United States. Best places to see in Tennessee: Turkey Vultures can be seen statewide. They are often seen roosting in the evening and early morning on communications towers. Sibley, D. A. 2001. The Sibley Guide to Bird Life and Behavior. A. A. Knopf, New York, NY.